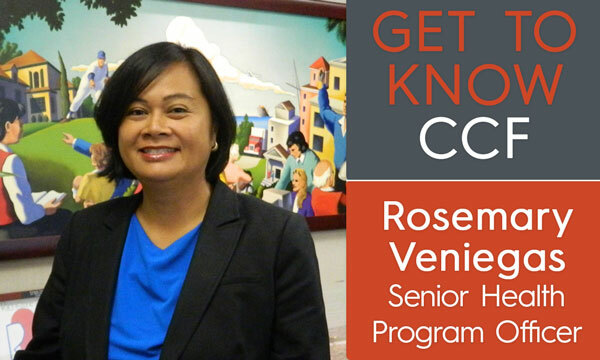 Rosemary Veniegas is a community health champion who has been working to strengthen Los Angeles communities for decades. She first joined the CCF family in 2012 and is now leading efforts to ensure all Angelenos have access to high-quality care, as the Foundation’s senior health program officer. Equipped with a Ph.D. in psychology and two decades of experience in implementing evidence-based health programs in communities, Rosemary was appointed chair of the L.A. County Hospital and Healthcare Delivery Commission earlier this year. As we celebrate her sixth-year anniversary with CCF, we sat down with Rosemary to ask a few questions about her career. Find out what motivates her to wake up every morning, ready to create a healthier Los Angeles. Question: What inspired you to pursue health equity work? Rosemary: The inspiration for joining CCF really was the Affordable Care Act. In fact, the day I interviewed here was the same day the Supreme Court was making the decision to uphold the ACA. I took it as a positive moment and, after over 12 years in academia, that it was time to make a change. I wanted to be a part of this important sea change that the ACA represents in how people access healthcare and why. I thought where can I do that in a way that helps my community the most? CCF offered that. Question: Why is it imperative that we address the root causes of poor health outcomes instead of applying so-called “band-aid approaches”? Rosemary: If you have people who are getting sick all the time and you just focus on the people who are getting sick but don’t try to understand what made them sick and is keeping them sick, you’re never really going to create health in communities. In public health, the classic example is: there was a set of neighborhoods where people were getting sick all the time. After a while, one person thought ‘well what links all of these people together?’. They found there was a pipe that had the disease and it was transmitting it to everyone in the neighborhood because they all got water from that pipe. Now fast-forward to Flint, Michigan where we have a situation with water that is not healthy for people. If we just focus on treating the people with symptoms from the bad water but we never try to fix the bad water, we’re just continuing to treat people who are ill. How have we really improved the world? How do we get to the true cause? It will take a long time to fix; we need to change the pipes that are corroded, ensure that there is adequate testing of water so that whatever is in it doesn’t keep making us sick and then perhaps have legislators or decision-makers who are going to continuously support testing of water and health services for communities where there is actual need because we haven’t fixed the water problem yet. Question: Outside of CCF partnerships, you’re also very involved as a leader in the L.A. health community— can you tell us about your role and how this type of integration helps drive your work? Rosemary: I’m currently the chair of the hospital commission for L.A. County and we work to address the needs of the patients who come through the four county-operated hospitals, the healthcare professionals who work there and the partners in 19 community clinics who also work closely with the hospitals. It is a volunteer position, we are not paid, and I consider it a public service and public benefit. Fairly regularly at CCF and in my past position, I have had people who contact me and say, “I need to find out if I have HIV” or “I have a friend who is having problems with substance use” or “I think I might have diabetes but don’t know where to go.” Part of why I think it’s important to be on the hospital commission is that so many of the folks that end up reaching out to me, a Foundation person, don’t really know where these services exist in the community or how to approach them or whom to contact. I see my service on the commission as being able to give accurate, timely and hopefully proximal information. I know which hospital is in someone’s community and where you can access HIV tests and what they’ll do once you get there. I can offer real information that people can act on as opposed to saying, “well we made a grant to this nonprofit and I think they have some diabetes program.” Instead, I can actually say “well, I have been to the site where they run tests that can predict diabetes. I visited the site where they offer mental health counseling, and this is how they improve their programs.” It’s really about having first-hand knowledge as someone who is trying to assess, ‘is this a program where I would want to send a friend? a family member? or my boss for services?’ We can help our communities better if we’ve actually spent the time learning, knowing and being in those spaces. To hear the rest of our conversation with Rosemary, please visit CCF’s Instagram page at Instagram.com/calfund and select the “Get to Know CCF” story series.